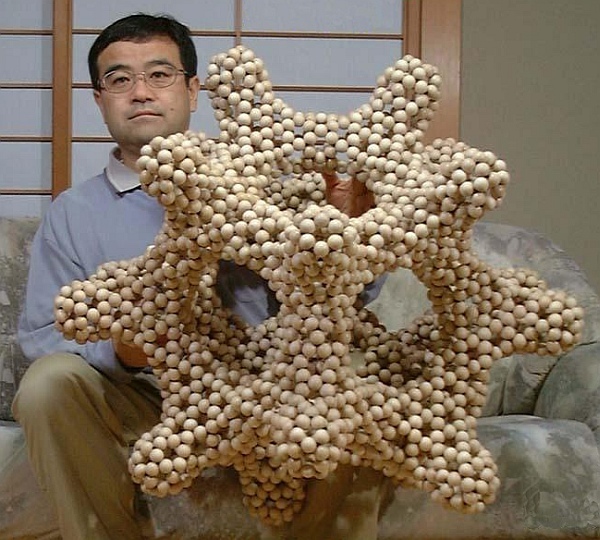 A few weeks ago this column showed an assortment of small geometric structures made from beads by Horibe Kazunori. Well, anything which is cool at hold-in-your-hand size becomes extra cool when scaled up to gigantic size. This beautiful form is based on a dodecahedron with blobs coming out of each vertex. I don’t imagine this was easy to make, but if you want to try one, observe how the cycles with five or seven beads are in places with positive or negative curvature, respectively. This article first appeared on Make: Online, September 12, 2011.